If you guessed that I’m currently experiencing a slight food posting obsession, you might be right. Tonight, I made Bacon Fried Rice. Yes, m’ams and sirs, that wasn’t a typo. BACON. YUM. Fried rice gotta be the EASIEST and FASTEST way to get a meal on the table. And it’s pretty awesome b/c you can throw anything you have in the fridge and it’ll still tastes yummy! Here’s how I made this rendition of fried rice. My ingredients change each time depending on what I can find in our fridge. 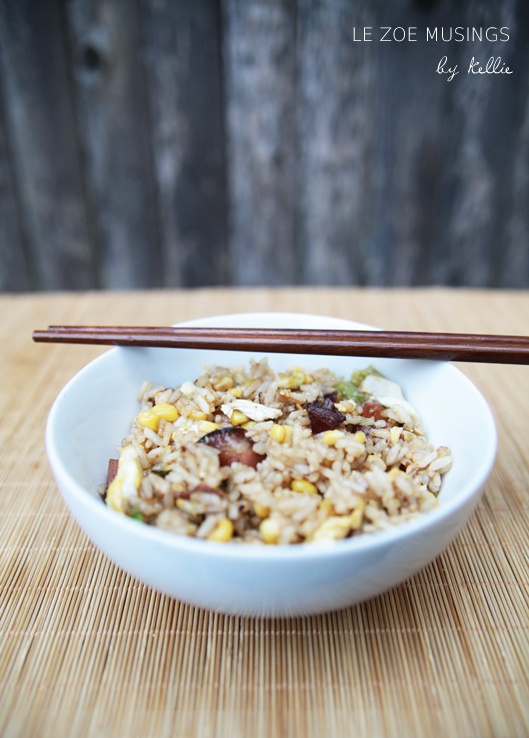 Usually, when we eat fried rice, there’s nothing else to cook and we’re just tossing together scraps of food. Yes, this literally means it’s the middle of the week and we are OUT of food. 5. At this time add soy sauce, oyster sauce, salt, + sesame oil (optional). There’s no measurement, I just kinda eye it and taste as I go. I like things to be on the saltier side. 6. Keep tossing the rice so it cooks evenly. Do this for about 8-10 mins. 7. Add the bacon chunks, eggs, and chopped romaine lettuce. You want the lettuce to just barely cook so it still has a crispy texture. Please note that you will NOT find this version at a Chinese restaurant! 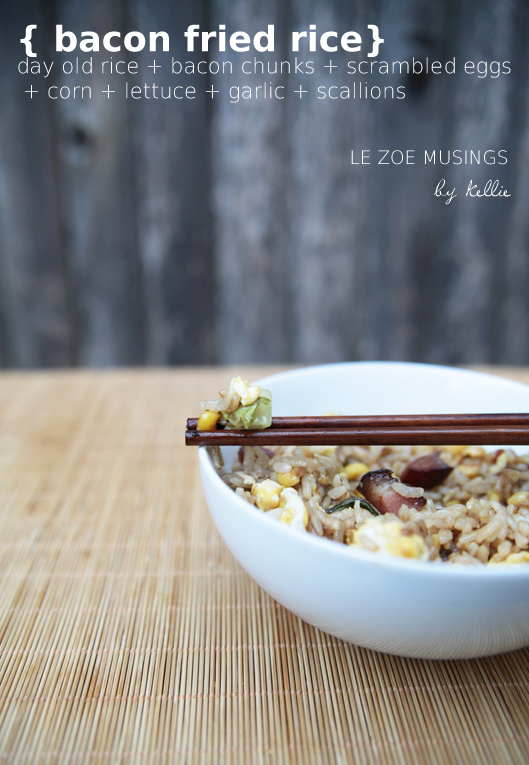 For another fried rice posting / recipe that I wrote, click here. Please let me know how it goes if you try out the recipes! Yum! Looks just like the bacon-fried rice my grandma makes! HI Sasha- I find it better to do the eggs separately so they don’t get ‘mushy’ over the rice. Have a GREAT day. Best, Kellie. I can smell it from here! Ooooh yummy! You should try it! Have a GREAT day. Best, Kellie. Thanks for checking out my blog! 🙂 This sounds delicious! I will try it out this week. I often do a fried rice dish once a week but with left over cous cous or quinoa instead of rice. Thanks for the reblogged! Have a GREAT day. Best, Kellie. Looks like a great recipe, I’ll have to give it a try. Thanks and thanks for stopping by my blog! Let me know how it goes! Have a GREAT day. Best, Kellie. Yum! We have a similar obsession. This looks yummy. Wish I had bacon in the house! Yesterday I didn’t feel like going to the store but had Indian leftovers in the fridge. I improvised an Indian-style fried rice using basmati white rice, garlic scapes (from our CSA), frozen peas, chopped tandoori chicken, and lots of spices (cumin, coriander, and touch of cinnamon, turmeric and crushed red pepper). Turned out great! for breakfast, lunch, or supper! I’ve made Spam fried rice and I love it! Thanks for the recipe tip! Yes, I grew up eating spam white rice in water and kimchi and all other yummy korean dishes. I have yet to ask my mom how she began to incorporate spam in her meal times. Time for a call. Yummy really loves bacon, genius idea, I Will try it ik the weekend. Thanks for the inspiration and have a wonderful Day! Three Things: 1. Your pics are great. I was/am a photographer. Your pics look professional. 2. Have you thought of trying out for a cooking competition? 3. Do you have a single sister who shares the same sense of style and cooking?! This looks great. I just shared it on Pinterest.